The Long-term service, led by Matthew Parry, provides our view on core international energy markets―oil, gas, coal, renewables and nuclear―out to 2040. Read more. In Q2 19, we will publish an update on the medium-term outlook—looking out five years—to ensure our forecast reflects the latest fundamental drivers at the prompt such as economic shifts, technology changes, and regulatory and political dynamics. Any updated views will be incorporated in the presentations and discussions at the workshop. Workshops will be held annually in both London and Houston. The workshop provides a forum for our analysts to present our long-term methodology and views and fully address topics of interest. Subscribing companies will have two seats at either the London or Houston workshop. Data behind our outlook for the five sources of primary energy―oil, coal, natural gas, nuclear and renewables―is made available. The data cover relative supply and demand on a global and regional basis, and price forecasts for crude oil and natural gas. 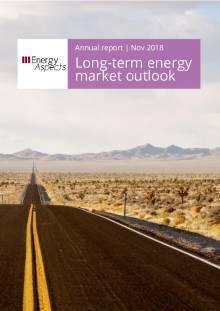 Downloadable presentation slides provide Energy Aspects’ view on the long-term outlook for key energy markets. Invitation to an annual workshop with our analysts.